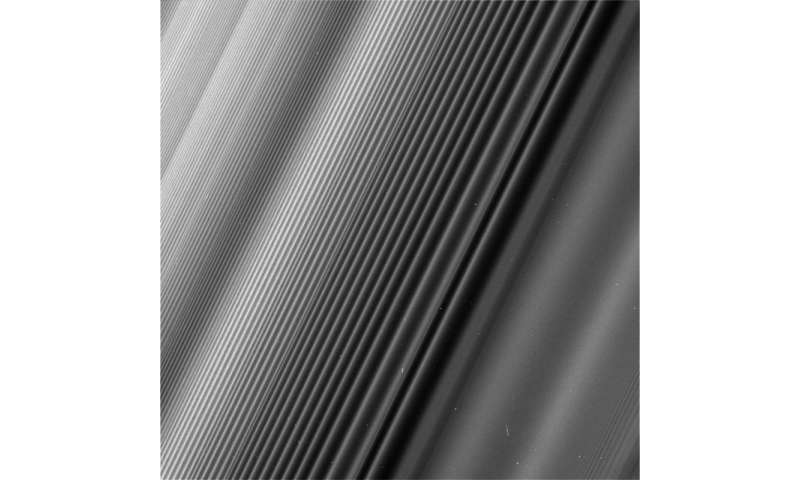 This view from NASA's Cassini spacecraft shows a wave structure in Saturn's rings known as the Janus 2:1 spiral density wave. Resulting from the same process that creates spiral galaxies, spiral density waves in Saturn's rings are much more tightly wound. In this case, every second wave crest is actually the same spiral arm which has encircled the entire planet multiple times. This is the only major density wave visible in Saturn's B ring. Most of the B ring is characterized by structures that dominate the areas where density waves might otherwise occur, but this innermost portion of the B ring is different. This wave is remarkable because Janus, the moon that generates it, is in a strange orbital configuration. Janus and Epimetheus share practically the same orbit and trade places every four years. Every time one of those orbit swaps takes place, the ring at this location responds, spawning a new crest in the wave. The distance between any pair of crests corresponds to four years' worth of the wave propagating downstream from the resonance, which means the wave seen here encodes many decades' worth of the orbital history of Janus and Epimetheus. According to this interpretation, the part of the wave at the very upper-left of this image corresponds to the positions of Janus and Epimetheus around the time of the Voyager flybys in 1980 and 1981, which is the time at which Janus and Epimetheus were first proven to be two distinct objects (they were first observed in 1966). There is no similarity, because Saturn rings are tidally locked, unlike the stars around the center of the galaxy.